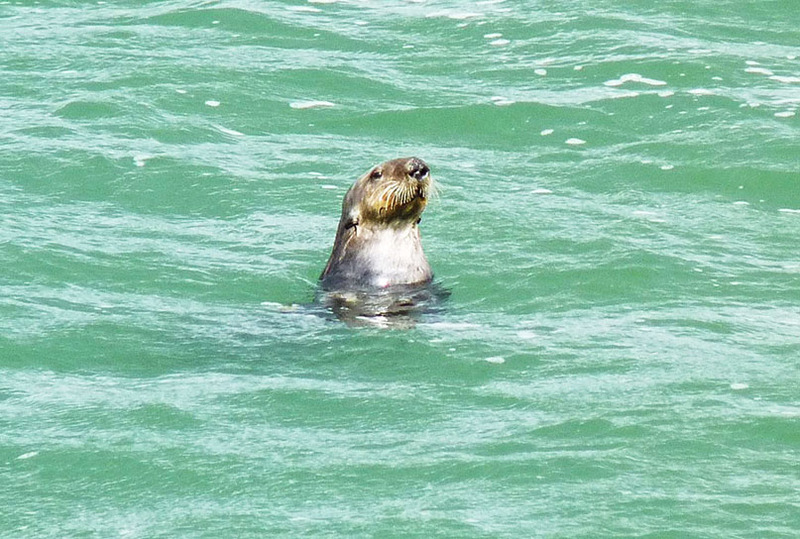 We decided to drive to the coast and spend a few days in Capitola before Roger's minor surgery for that small squamous cell carcinoma bump next to his eye. Interestingly, Roger is more anxious about this surgery than he was about his colon cancer surgery. Here's why: He is not going to have a general anesthetic, just a local right there next to his eye. And then… he is going to be awake the whole time the surgery is happening right there next to his eye. See? It's a little claustrophic with surgeon hands, and an assistant, and Roger's eye. So he's anxious. He called the surgeon and asked for a prescription for Atavan, and the doc prescribed Valium. Good enough. He'll relax with some Valium. Right? Well, he went to pick up the prescription and the pharmacist handed it to him and said, "Here's your one valium. That'll be 33 cents!" Seriously one valium for Roger? That's crazy. Roger is a fainter. His GP once had to lance an abscess on his shin while Roger was lying on the floor. So we came to the coast to relax before the surgery on April 9th. A good storm is supposed to blow in Monday and Tuesday so we walked down to the wharf right away to get some sunshine and view of the calming blue-green waters. 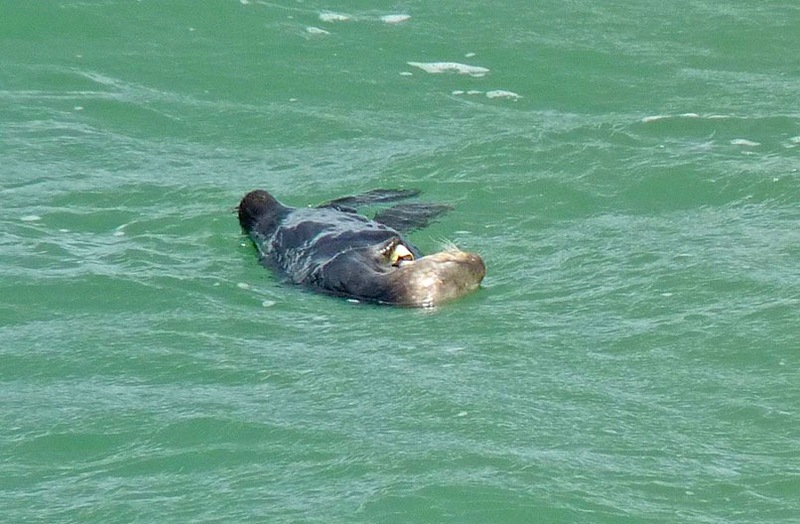 That's how we feel when we see an otter eating or looking back at us. 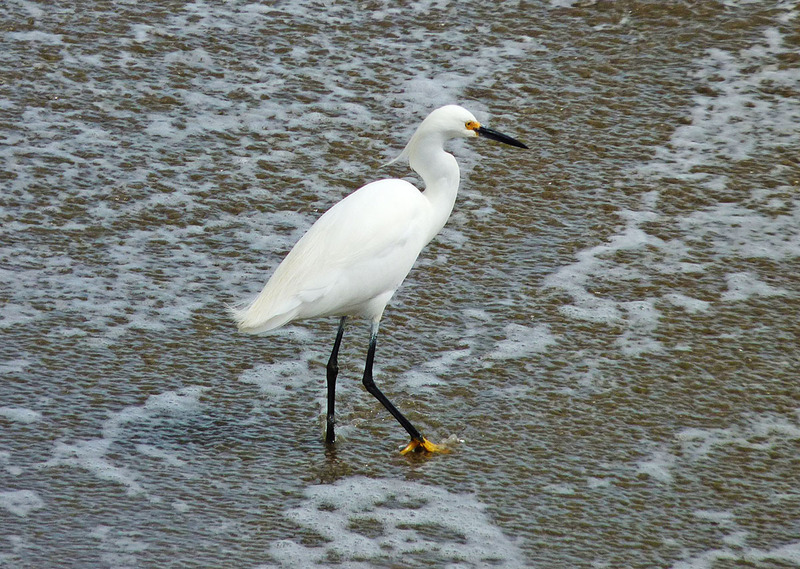 That's how we feel when we see a Snowy Egret walking the surf line looking for food. We understand now why we came this way. 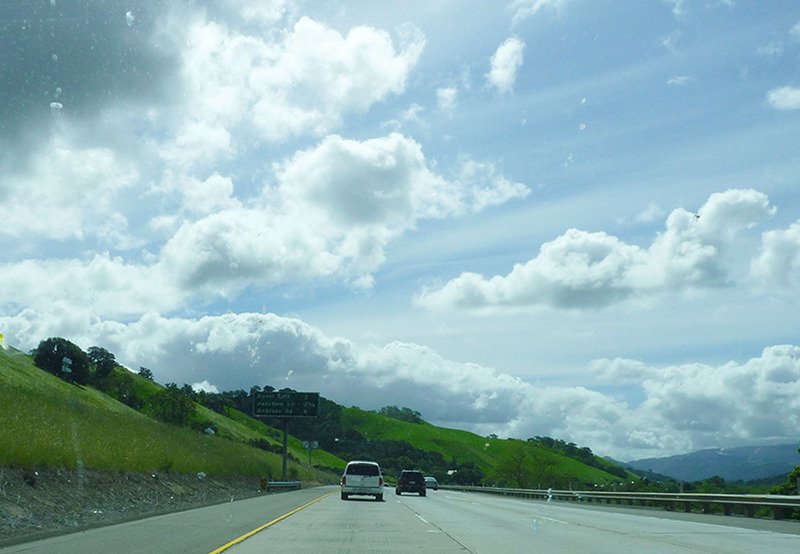 In February the skies were uniformly gray. Most of March, they have been endlessly blue. For an atmospheric optic lover, it has been a long stretch of time without having to run for the camera for a quick shot of something beautifully ephemeral. Then this happened. What is this? 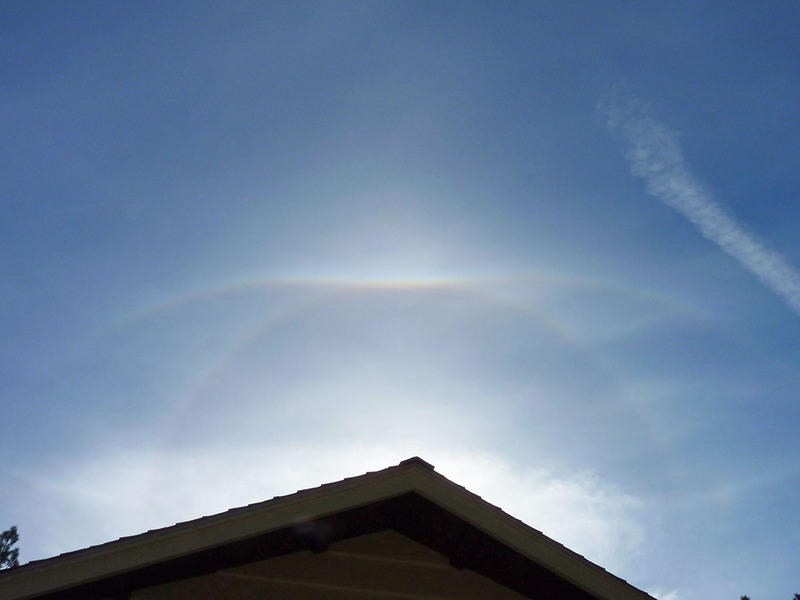 It's a supralateral arc with a circumzenithal arc above; it's a 22 degree halo with some other kind of arc shining off the top of it. Ooh. I was really really happy to see this. I couldn't stop running outside to look up, even though I was in the middle of preparing food for dear friends who were coming to visit to take a nice long walk with us. Yes, I ran outside again. The upper supralateral and circumzenithal arcs had disappeared, but I saw this. Oooh, this sight made me dancing-happy (like that Pharrell Williams song). Oh yes. This is the kind of thing I would run outside and let food burn on the stove for, luckily it didn't come to that! I know that we are looking at a 22 degree halo here, but it's the other stuff that's a bit more tricky. 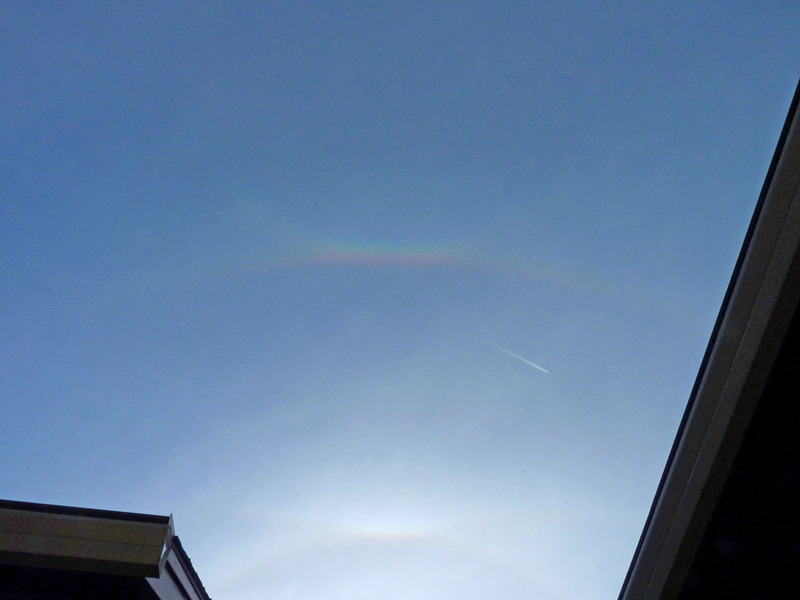 I think there's an upper tangent arc and very faintly a parhelic circle with the hint of a sundog on the right. This was truly one of the best arcs and halos moments I have ever experienced. Our friends arrived for lunch and a walk. We took one of our local ditch walks right out the door. We love when we don't have to get into the car to take a hike. We call this the upper ditch because we do have to walk quite a bit uphill to get here. There were native plants blooming along the trail. 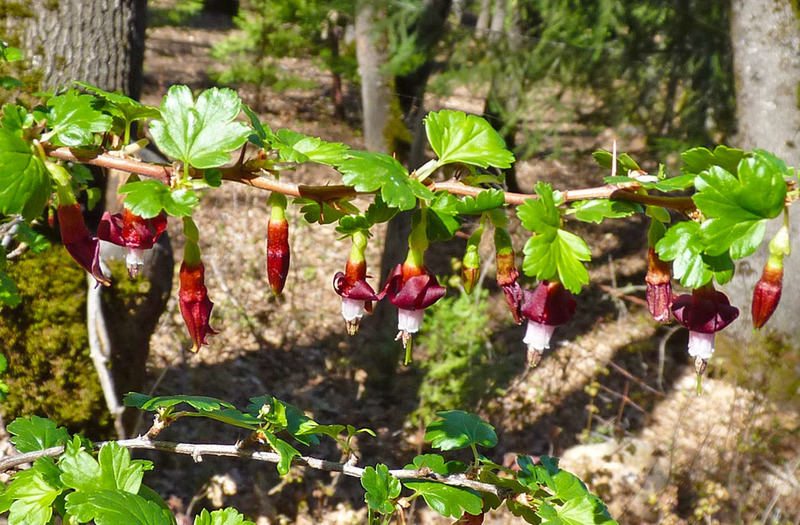 Like this Sierra Gooseberry (Ribes roezlii). 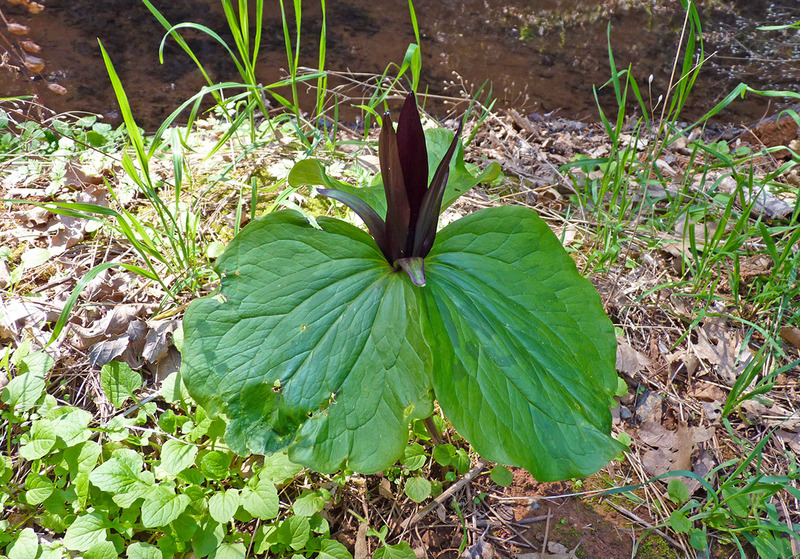 And this Giant Trillium called a Wakerobin (Trillium angustipetalum). We had a wonderful walk with good friends under a dazzling blue sky. We sure do love a happy-dancing kind of day like this! Two weeks just flew by without a post here. 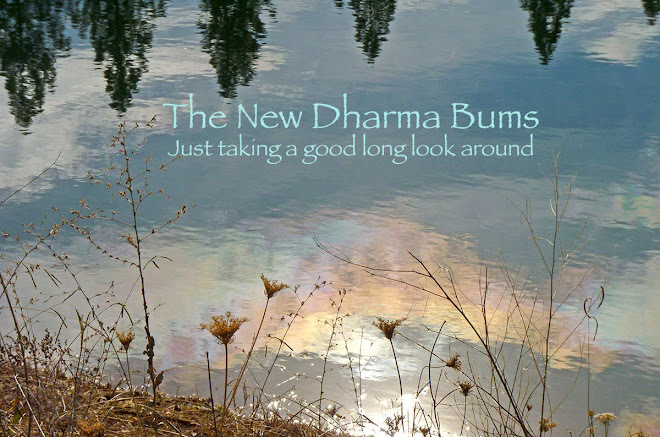 We've been distracted by doctor visits and PET scans, biopsies and fatigue. So far the reports have been good, we're waiting on the biopsy results. Roger has a bump near the corner of his eye where it meets his very lovely nose. 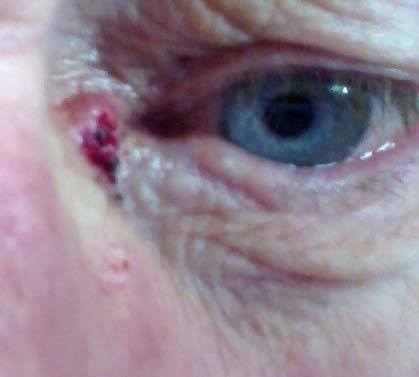 The surgeon and the oncologist both think it looks like basal cell or squamous cell carcinoma. Wouldn't be much of a problem except for where it is located. The surgeon happens to also be a plastic surgeon who specializes in keeping faces beautiful. You should see his waiting room, the pamphlets just scream BOTOX LASER LIPOSUCTION TUMMY TUCK!!!! But they also do very serious work on faces that need careful surgeries to remove cancer. For those of you who don't know Roger's cancer history. Here's a link that may explain our concern. On the very bright and sunny side of life, the weather has cleared up and taken a sharp and beautiful turn toward spring. 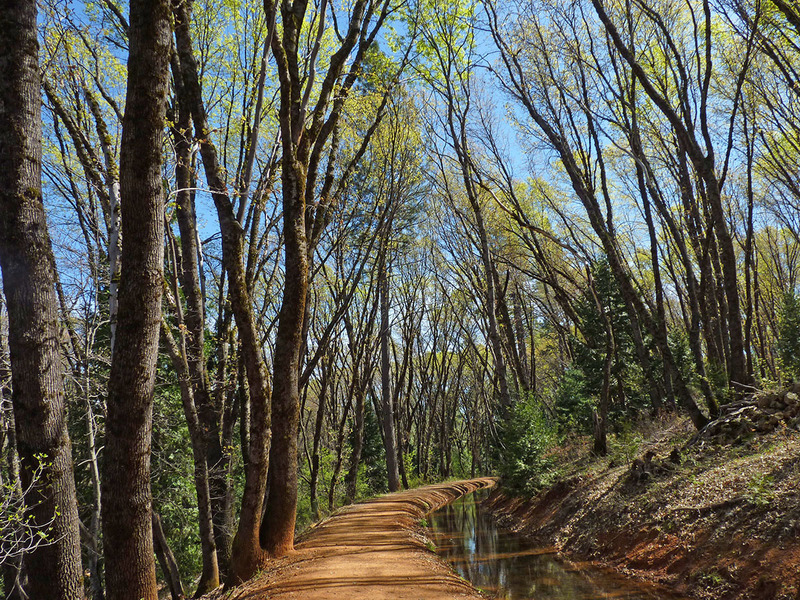 Temps have been in the high 60s and low 70s, blues skies and plenty of opportunities for walks in our little woods. 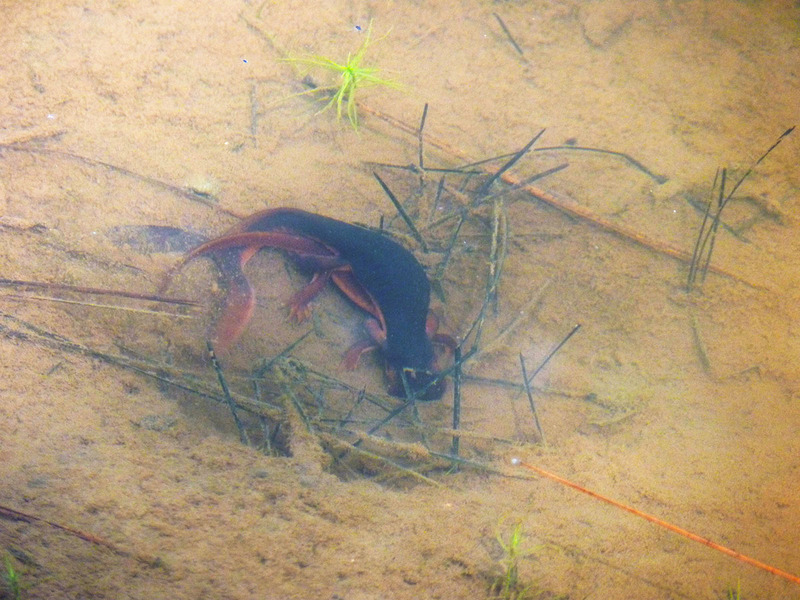 One of our most favorite signs of spring is the return of the Sierra Newts to the local waterways where they tangle their bodies and make more newts! These two are the first of the season. There will be plenty more. 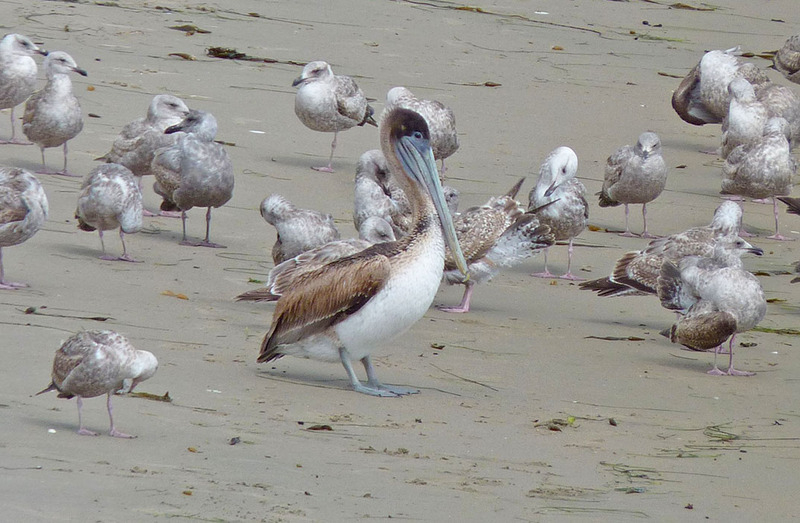 The mass tangle of bodies can grow quite large, with many males all vying for one female. The rains did bring out even more mushrooms and fungus, which always makes us happy. This particular specimen was huge. 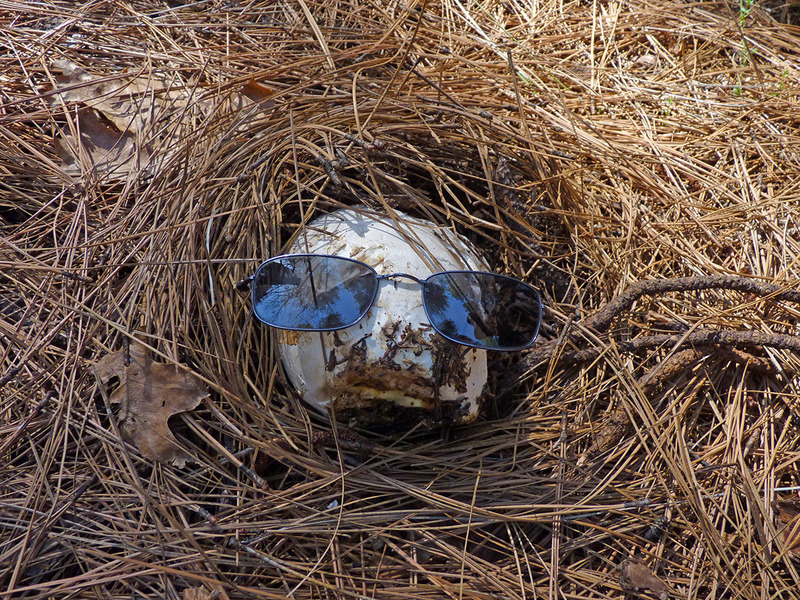 We loved how it looked like a crazy giant egg in a lovely pine needle nest. Some critter had already found it and done a bit of nibbling. Still, it was quite beautiful to pull up and take a good look at its other-worldy mushroom anatomy. This is going to provide a meal for many more critters. Yum. 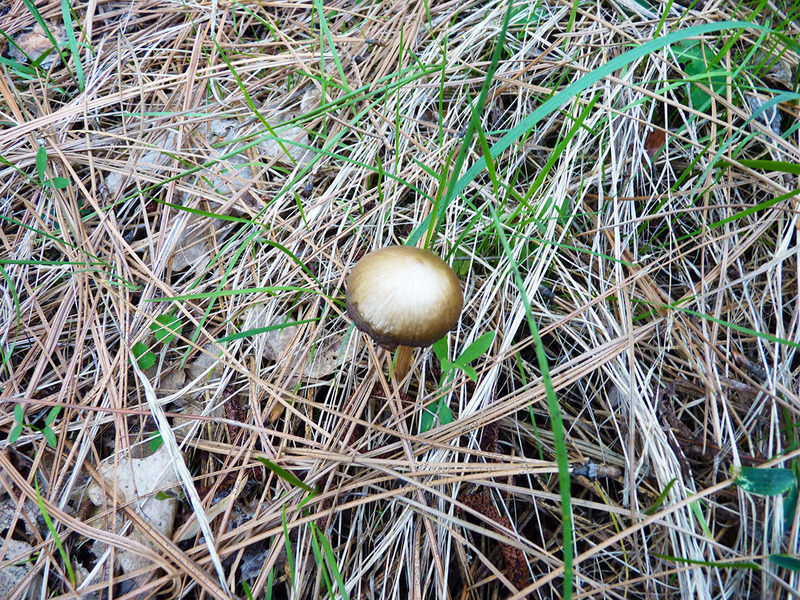 We hadn't seen a golden-topped mushroom like this since 2009. It's like finding a sparkling jewel in the grass. Wouldn't it have been funny if this was the gold that all those miners came to the mountains to exploit in the 1850s? 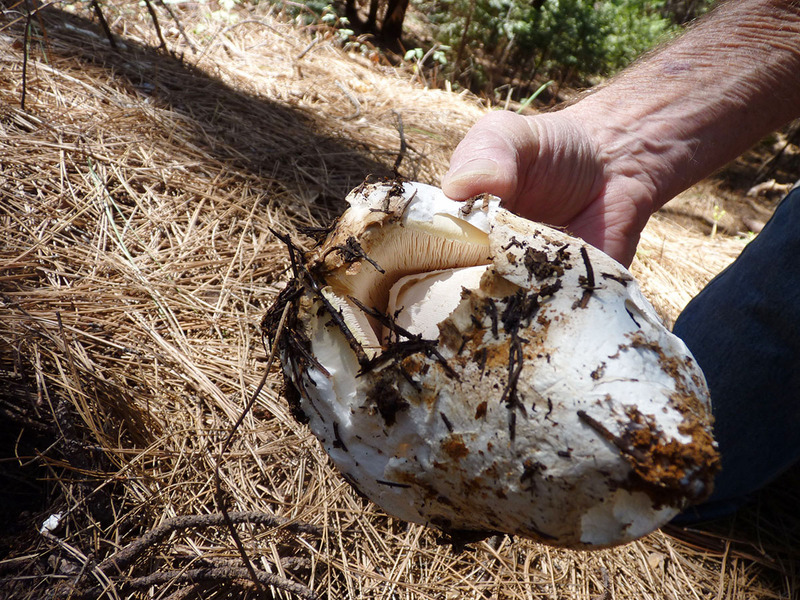 Ah, but it's just a little mushroom that merely hints at the real old treasures in these hills. The rains came again, 4.25 inches (10.795 cm) in two days. We appreciated every drop of it, even if it did mean staying in the house with the dark foreboding skies looming over us before, during, and after the storms. When there was finally some light in the sky at the end of the day, I ran outside to get a photo. It was still raining, but there was light! 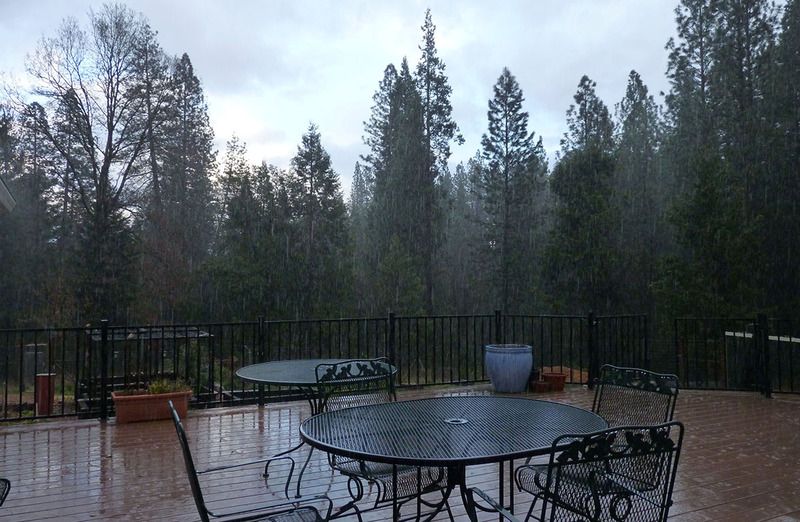 This kind of weather doesn't make for very good photographic opportunities, so we sit in front of the fire and plan our escape from the foothills back to the coast. 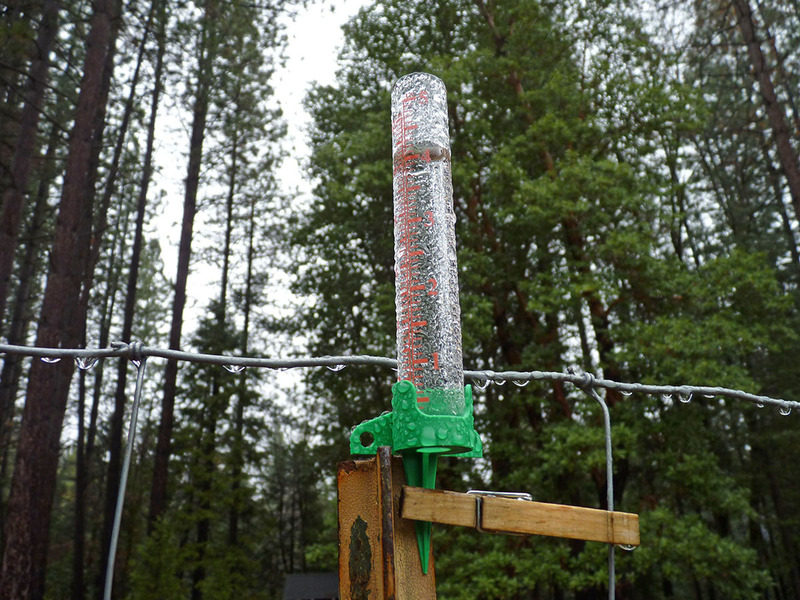 We watch the water collect in the rain gauge. Any break in the rain is a chance for a walk, even a short one, so we take what we can get. 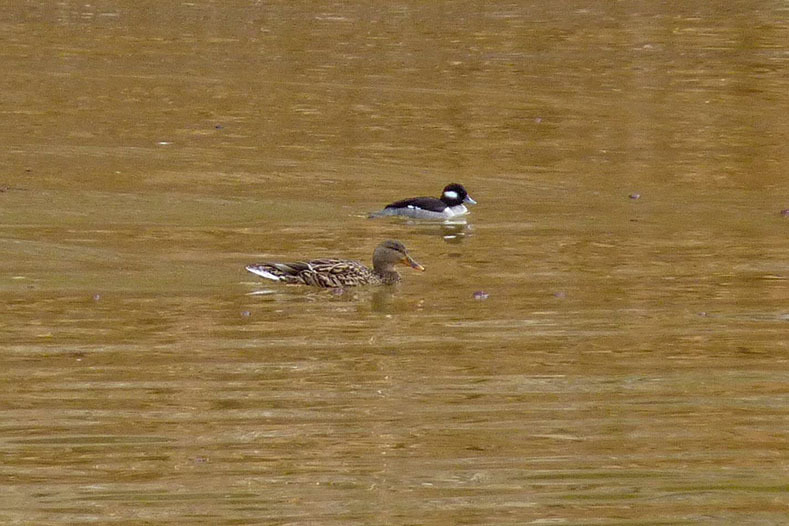 Up on the muddy reservoir we watch a female mallard and bufflehead together. Nice little moment to see the difference in their sizes. Buffleheads are the smallest ducks and very very cute. 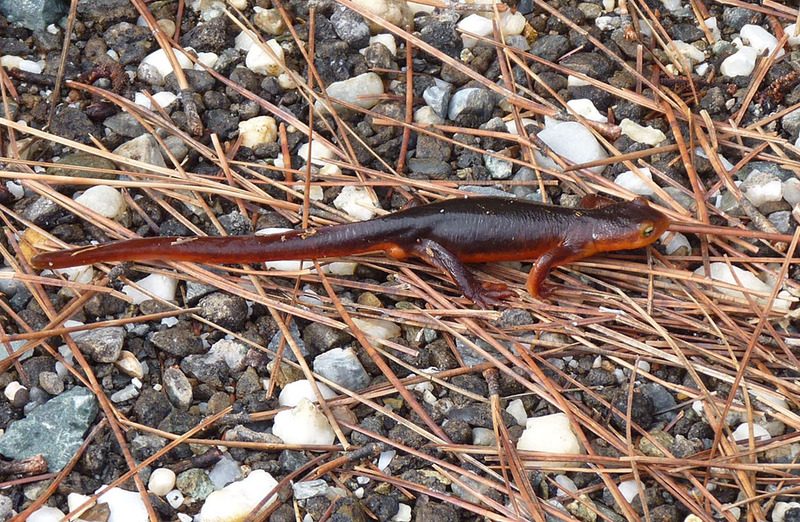 This Sierra newt, who we dubbed Mr. Gingrich, of course, was the first of the season. We think there was a bit of a diesel spill in the reservoir, which explains why Mr Gingrich is heading away from the water. And the beautiful rains always coax the fungus from their slumbers. 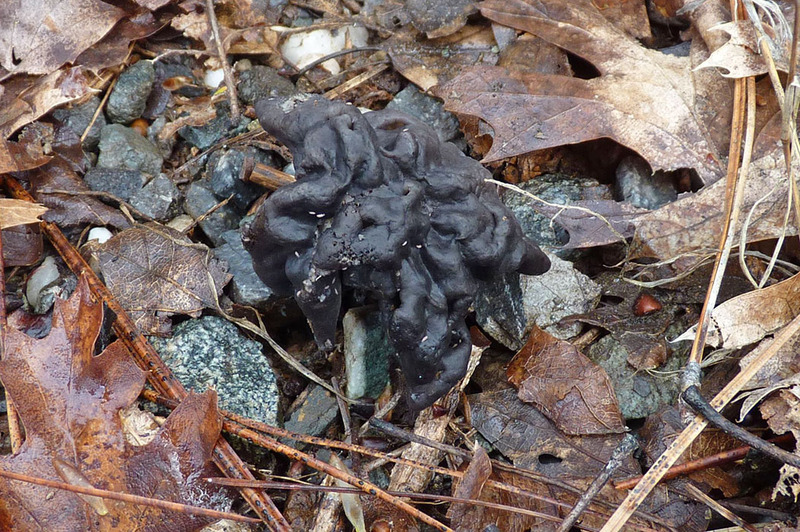 This is a Black Elfin, a Helvella lacunosa. We haven't seen one of these since 2009. A dark crazy surprise from under the rain soaked leaves. Some people eat these, but the look alone makes them seem creepily inedible to me. It's still raining. February's monthly total was 17 inches (43.18 cm), almost twice our normal monthly average. Whee!